Mineral imbalances can cause major loss of profit to farmers. Correct vitamin, mineral and trace element balance is essential for the prevention of a wide range of problems including lameness, ill thrift, reduced immunity, poor skin/hair quality and reduced live-weight gain. Forage Analysis has shown that most Irish soils are deficient in the key trace elements Selenium, Zinc, Copper and Manganese. These trace elements have major roles in animal performance and fertility. 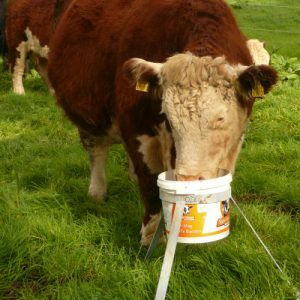 It is important to think about giving cattle mineral licks as you are leaving them out to grass after the winter to restore any minerals that may have been lost during the calving period and from poor quality silage. These licks can always be a worry as they increase the risk of badgers interfering with them and spreading TB to your herd. 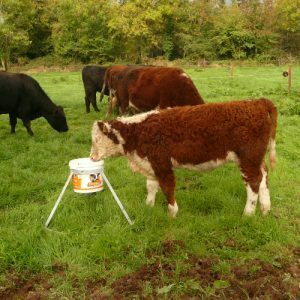 O’ Donovan Engineering has introduced a product that will put your mind to ease when it comes to badgers spreading TB. 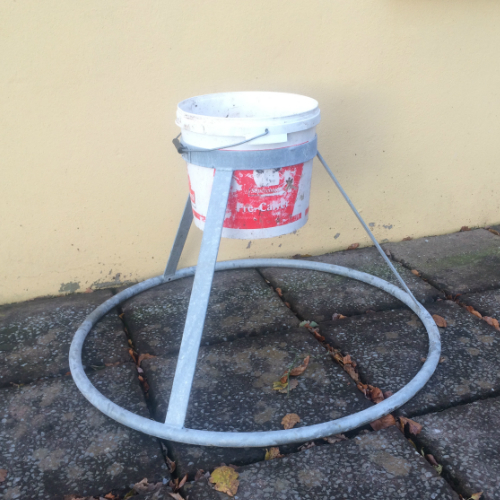 This new mineral lick bucket stand lifts the lick off the ground by 500mm and out of badgers reach. This will prevent badgers urine or faeces contaminating the lick and spreading the disease. Not only does it prevent the lick from badgers it also prevents the cows themselves from kicking over the bucket and dirtying or wasting the lick. We have been testing this product on our research farm for over a year now and we are very happy with the results.